Want to be notified of new releases in probot/attachments? A Probot extension to add message attachments to comments on GitHub. 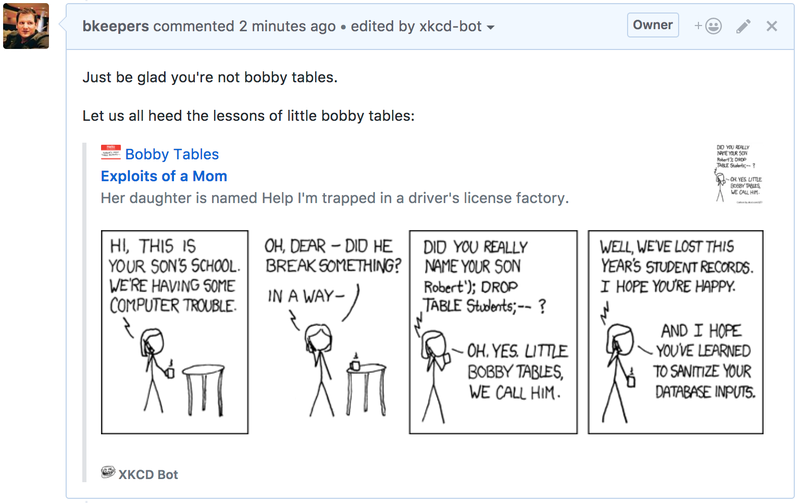 Here is a probot app that listens for a comment that matches bobby tables and adds an attachment to the comment. This extension is what you might call "a hack". GitHub doesn't have an API for adding attachments on comments, but it does have rather large comment fields that support some HTML. This extension renders the attachment as a blockquote and appends it to the original comment body. This extension is inspired by Slack's message attachments.